With the promise of warmer temperatures coming to the Valley (it's an absolute ice box here! I just turned on my heat again. Shiver. ), I'll be much more open to the idea of attending local art events, parties & happy hours. Well, full disclosure, I've never been one to turn down a great happy hour. 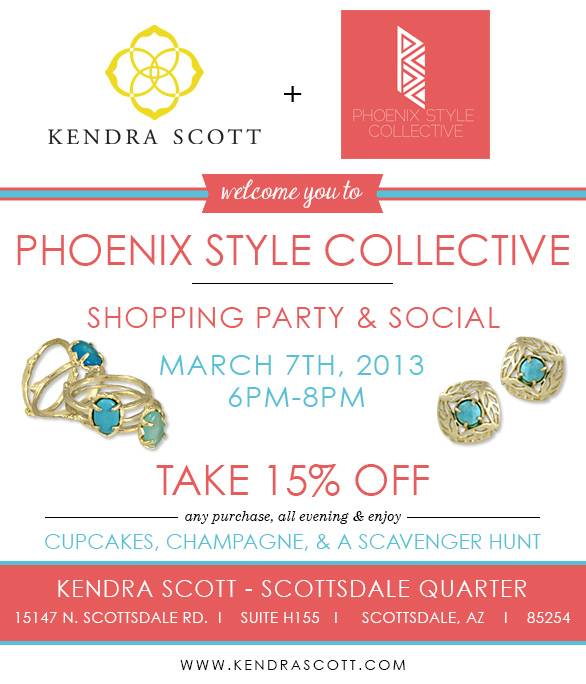 First up, the Phoenix Style Collective crew and I will be hosting a fabulous event at the brand new Kendra Scott store at the Scottsdale Quarter. Come stop by for cupcakes, champagne, and catching up with your favorite stylish local ladies & gentleman. We always have such a fun turn out at these events - thank you to all who come out! Thinking I might need a new ring or sparkly pair of earrings after this night. The second is an art show featuring the talented other half to my friend Courtney. Sanford and his friends will be displaying "An Exhibition of Excessive Bravado", which is sure to be an absolute blast. The collection debuts on March 25 at Gallery 100 at ASU's Herberger Institute School of Art, with the opening reception on March 26 from 6 to 8 p.m. I'll certainly be there - I hope you will too! Three cheers to local Phoenix & Scottsdale fun! Spring is in the air!